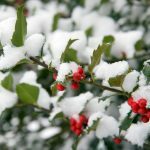 Most of us are family with holly shrubs in the landscape and growing American holly trees (Ilex opaca) is a relatively easy endeavor. Read on to learn more about this holly species. These attractive, broad-leaf evergreen trees grow 15-50’ tall. They are pyramidal in shape and are known for their striking red berries and deep green, leathery leaves with sharp points. 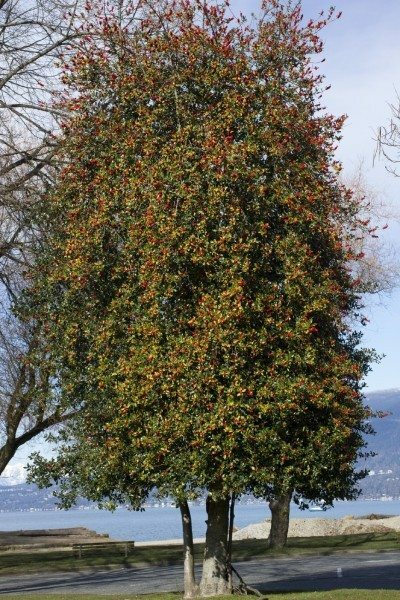 American holly trees are terrific landscape plants. They are great for habitat, too. The dense foliage provides cover for small critters and the berries provide food for many birds. The most important note of American holly information is that these trees are dioecious, meaning these plants are either male or female. It is the female that produces the red berries. It typically takes 5 years or more to tell if you have a female. If you want the red berries (and most of us do), you need to buy an identified female from a nursery or plant at least four or five of them to increase your odds. American holly planting is easy as long as you choose containerized or balled and burlapped specimens. Do not plant bare root trees. They usually fail. American holly trees can take all types of soil but prefer slightly acidic, good draining, sandy soil. American holly trees perform well in shade and full sun but prefer partial sun. These trees like regular and even moisture but they can also tolerate some flooding, occasional drought and ocean salt spray. These are tough trees! If you are wondering about American holly tree care, there really isn’t much to do. Make sure you plant them in an area that is protected from harsh, drying, winter winds. Keep their soil moist. Prune them only if they form irregular branches or if you want to shear them into a hedge. They do not succumb to many pests or diseases. They are somewhat slow growing at 12-24” per year. So be patient. It is worth the wait!